Sat, Sep 8, 2018, 11:56 am SL Time, ColomboPage News Desk, Sri Lanka. 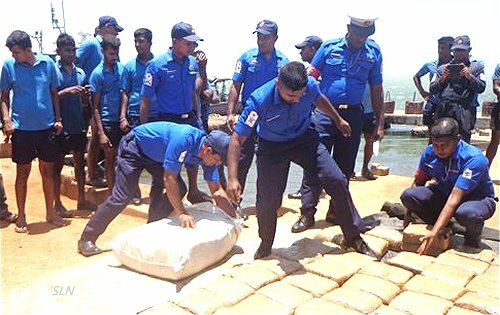 Sept 08, Colombo: Sri Lanka Navy has recovered over 280 kilograms of Kerala Cannabis (ganja) floating in the sea southeast of the Iranativu island in the North. This stock of cannabis is recorded as the largest haul recovered by the Navy in the recent history. The Navy Media unit said the naval personnel onboard 3 Inshore Patrol Craft (IPCs) attached to the North Central Naval Command, during routine patrol, found 284.5kg of Kerala Cannabis floating in the sea area southeast of Iranativu island yesterday (07th September). It is suspected that the haul of cannabis which has been packed into 95 parcels has been dumped at sea with the intention of bringing them to the shore later. The recovered haul of cannabis with a street value of Rs. 30 million was handed over to the Mulankavil Police for onward action.